How do social groups at Learnmet work? Learnmet group is an online collaboration hub for Learnmet users. Learnmet group can be used by Instructors to collaborate with a student group or many students can connect as a friends group or an organization can create online collaboration groups for their employees or customers. A Learnmet group could be private or public. Group members will have the abilities to share content, video, photos, links. A group owner or a group admin could attach files for group members to access. 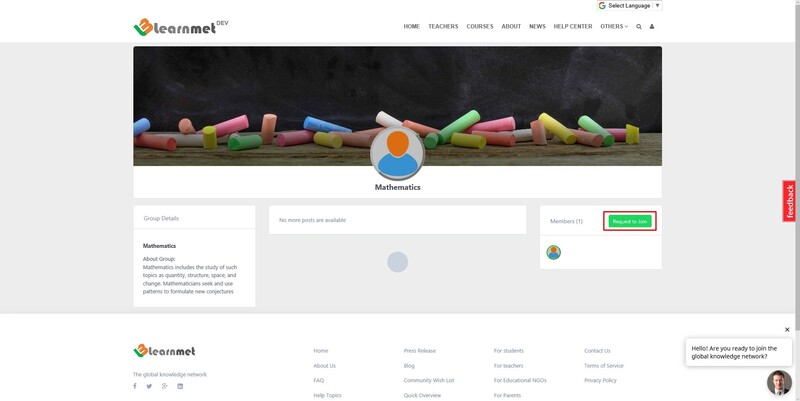 All members of a Learnmet group can invite their Learnmet or outside Learnmet connections to join a group, however, all request approvals are managed by the group owner. 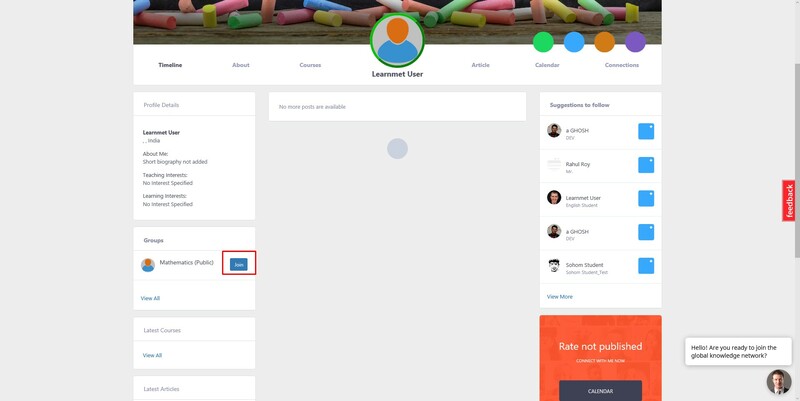 Step 1: Go to www.learnmet.com and login to your social timeline and scroll down to below Profile Intro to get Group functions in the Left panel of the page, click "View All" button. The system will redirect to the Group Management page. Step 2: Click "Create Group" button to start creating a new group. Step 3: Enter Group Name and Group Description. Step 4: Choose the group type as Private or Public. If you click the radio button and turn into red, it will be a Private group. Step 5: Type username in "invite User" field system will give you suggestion to invite as per your type. Step 6: Click "Create Group" system will show the confirmation message and redirect you to the group page. Step 7: You can add users from the group page by clicking the "+" button above the Members' tab on the right side of the page. Step 8: User will get join invitation in his registered email id, the user just need to click the accept invitation button to join the group. Please note: Other members / Users can only send Join Request to Public Groups, join request cannot be made for Private Groups. Step 10: Navigate to the "Manage Group" page by clicking "+" button on the group tab to manage your group's member, removing an existing group member or to view pending requests of other members. Note: Group Manage can be done by Group Owner or Creator of the group. Step 11: To accept Join Request just click "Accept Request" button, to send join group to your known member just click "Resend Request" and to to remove an user from the group just click "x" button under active users. Not using Learnmet yet? Click to get started for free!